A $50 Billion Chinese Canal in Nicaragua? There is pride in Hong Kong that a local private company is pushing ahead with perhaps the world's largest-ever civil works project, the 280km long, 500m wideNicaragua Canal. Construction began in December 2014. The South China Morning Post dismisses outside suspicions while modestly describing the scheme as being “centered on the creation of a more just, reasonable and equitable world order.” That a private company should be undertaking such munificence is remarkable. One thing's for certain: it can't be doing it for the money. Financially the numbers don't add up. At a cost of at least US$50 billion, the project will take many years and require tens of thousands of workers. Legal, social, corruption and environmental concerns aside (and all are daunting), the financial returns are violently challenged. The century-old Panama Canal, which is struggling through its own US$5 billion upgrade to double its potential traffic, generates about US$2 billion in annual revenues, about half of which are retained as profits. Building parallel infrastructure in Nicaragua at huge sunk expense will provoke a knife-fight response from Panama, which has capacity to spare. Although the Nicaragua canal will allow larger-sized ships to pass, Panama should retain most of the transit share, and will slash pricing to make sure. In that case, the canals' combined annual profit pool might be much less than the US$1 billion today. Commercially speaking, this US$50 billion gambit is courageous, if not reckless. There is of course another possible explanation: that the company is a front for Beijing, that it will rely heavily on cheap long-term financing from state institutions, and that the canal is to secure access for Chinese shipping. There is plenty of scuttlebutt on the internet about the company's mysterious chairman (he says he is “just a businessman”) and China's strategic game plan. US$50 billion is serious money, way beyond the exposure limits of institutions like the World Bank but feasible for the Chinese agencies which long ago surpassed it. If this canal is built, it will mostly be with Chinese state contractors and funds. True, companies can raise US$10 billion or even US$20 billion in international public equity, but these are special cases (like Alibaba) for proven businesses. This gargantuan engineering enterprise also has the audacious hallmarks of a Chinese Government design. But if it is, why would Beijing wish to hide behind a supposed Hong Kong-based entrepreneur? China enjoys excellent relations with Nicaragua's charismatic Daniel Ortega, who in turn is no friend of the US. Maybe Ortega is simply downplaying Beijing's role in order not to antagonize the yanqui. Perhaps Beijing is happy to maintain plausible deniability for now, and will later assume greater ownership over the enterprise once it has matured and the Americans have resigned themselves to its existence. Although the targeted financial payback is just 12 years, with operations underway by 2019, both these estimates seem fanciful. In reality, the project is likely to see overruns and delays, so the operating concession might be 50 or even 100 years. Then a Chinese entity – perhaps the state itself – will have long-term control over a key “chokepoint” into the Atlantic. The Nicaragua canal would prioritize Chinese shipping: containers to the US eastern seaboard, tankers from Venezuela, iron-ore carriers from Brazil, perhaps even PLA Navy warships. That sounds pretty sensational. But what is really gained here? As noted above, the canal is broadly replicating what already exists in Panama. The shipping distance to the western Atlantic is not shortened; Hong Kong is equidistant via the Suez. And the Atlantic southern capes offer other entry points. If the specific objective is ensuring passage for Chinese naval vessels through the central American isthmus into the Caribbean, it must be obvious to Beijing that – with or without a second canal – it can only be at the forbearance of the US. And those PLA Navy ships will be a very long way from their home port. There is a broader agenda here, obviously. With its diplomatic “whirlwind” China is seeking greater access to world markets and wants new trade routes opened, preferably under its own aegis. 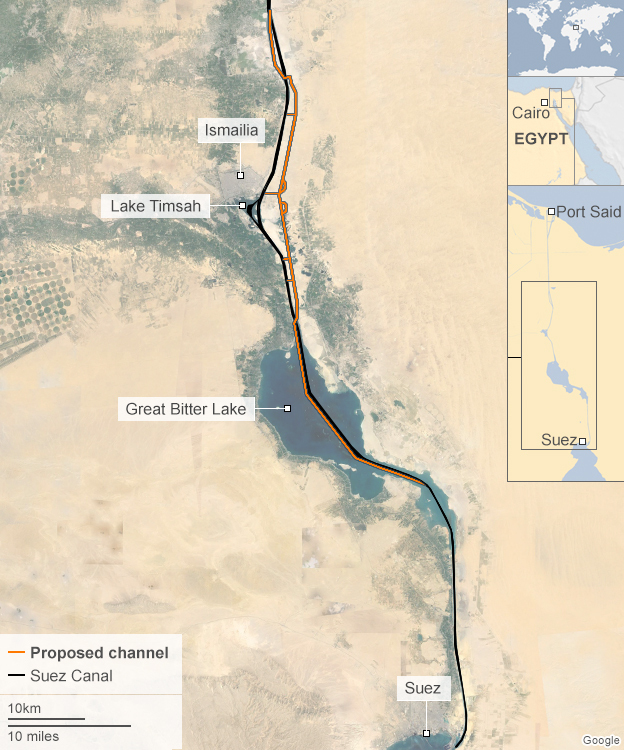 "Officials say the new waterway will be a symbol of the new Egypt"
Few things in Egypt are more iconic, revered and profitable than the Suez Canal. So in a bid to refloat the country's ailing economy, President Abdul Fattah al-Sisi is building another one. He broke ground on the second Suez Canal last August, at a ceremony full of pomp and patriotism. With fighter jets conducting aerial displays overhead, Egypt's new strongman promised it would be "a channel of prosperity". It was not plain sailing at the start. There was some flooding at the drilling site in September. Added to that, commemorative stamps were issued featuring an image of the Panama Canal, more than 11,000km (7,000 miles) away. Since then the project has moved into high gear, with building work around the clock. 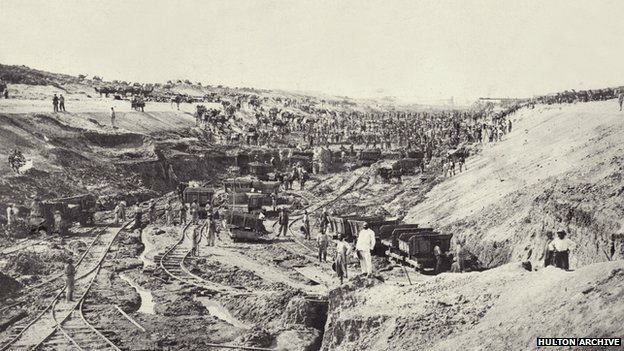 The original Suez Canal, which opened in 1869, took 10 years to build. Egypt's Investment Minister Ashraf Salman: "Twelve months is challenging, not unrealistic." President Sisi has decreed that the new waterway will be completed in one. Egyptian officials say the deadline will be met, and the first ship will navigate through the new canal in early August 2015. The canal, which links the Mediterranean and the Red Sea, is the fastest shipping route between Europe and Asia. It handles 7% of global sea-borne trade, and is one of Egypt's main sources of foreign currency income. The new lane will allow two-way traffic in part of the canal, reducing transit and waiting times. Officials say it will double the capacity of the existing waterway and almost triple revenues in fewer than 10 years, from $5.3bn (£3.5bn) in 2014 to $13.2bn in 2023. 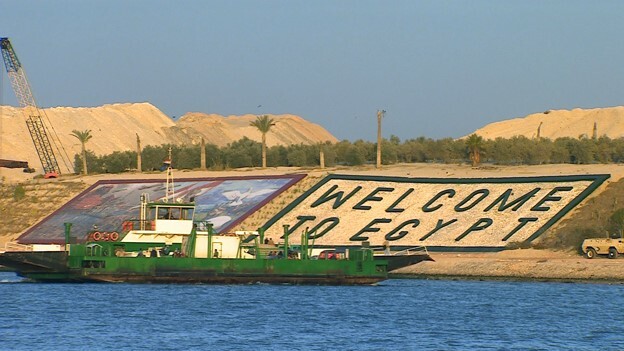 As well as building a second channel, Egypt plans to create a major logistics and shipping corridor alongside the canal banks. 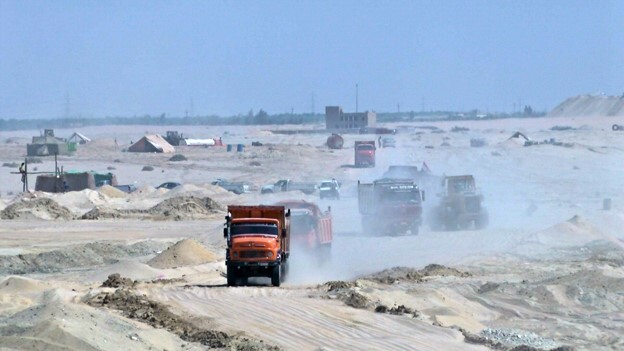 Officials have dubbed the project "the Great Egyptian Dream", and the nation has bought into it - quite literally. The Egyptian public financed the new canal by investing $8.5bn in just eight days. Officials say the expansion is about far more than the bottom line. 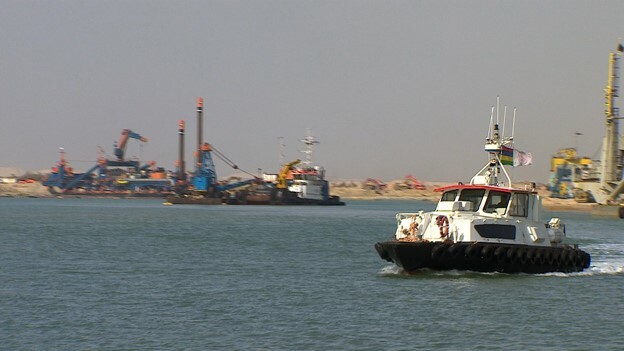 The project will be "a rebirth" for Egypt, according to the Head of the Suez Canal Authority, Adm Mohab Mameesh. "After the most difficult three years in our history, we are building a new Egypt," he told me at the water's edge. "Our grandfathers were digging the Suez Canal, and we are digging the new Suez Canal not for us but for the future, for our children and our grandchildren, and for all the world." 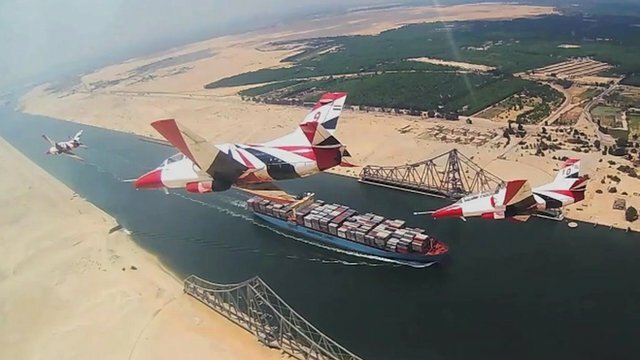 Suez has been synonymous with national pride since 1956, when President Gamal Abdel Nasser seized the canal from the British and French, prompting them - and the Israelis - to attack. The waterway later played a role in the Middle East wars of 1967 and 1973. Adm Mameesh said it would now be part of a new battle - "a war of development". We were given a tour on a tugboat, passing earthmovers and dump trucks on the banks, as well as some British war graves. Fishermen bobbed past in sailboats, one holding up his catch. We nosed briefly into the new canal - about 20m (66ft) in - where huge dredging platforms sprout from the water. This kind of access is rare - the canal area is under tight military control. The army engineering corps is leading the drilling. There was a leak this week, caused by the collapse of a bridge, but officials said there were no injuries or delays with building. Ministers admit there is a great deal at stake, including Egypt's international credibility. "I think it's crucial for restoring confidence," said Investment Minister Ashraf Salman. "It will show the whole world that Egypt is committed and into implementation. It will put Egypt on the map again." That is if the project is completed successfully. Some international experts predicted it would take five years. The minister insisted it would be finished in one. "Actually it is challenging, not unrealistic," he told me. "I think the Egyptians who have done two revolutions in two years are capable of something like that. We are monitoring this project every day. We are ahead of schedule." Some experts are dubious about the timeframe, others about the revenue projections. They doubt the growth in global shipping in the coming years will justify Egypt's forecasts. Some believe the money to build another waterway would be better spent elsewhere. 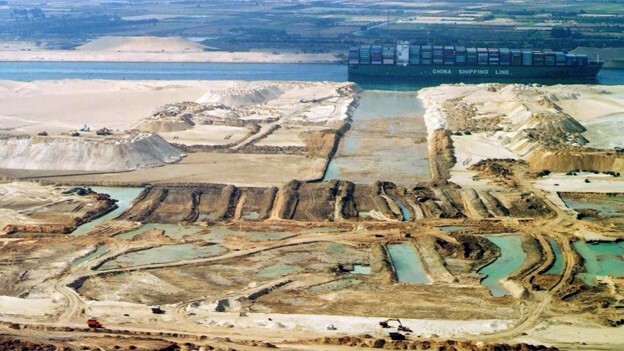 "In the case of the Suez Canal it's a patriotic project first of all, and that's very difficult to quantify," said Cairo-based investment analyst Angus Blair, president of the Signet Institute. "From an economic point of view it can be argued, and I think pretty well, that around $8bn could have been used on upgrading Egypt's infrastructure, power stations, mass public transport in the cities, new trams, and new housing." There are also some concerns about whether the jihadist insurgency in part of the Sinai Peninsula could threaten the strategic waterway - which also serves as a transit route for the US Navy. Insurgents managed to strike a container vessel with a rocket-propelled grenade in 2013, causing minor damage. 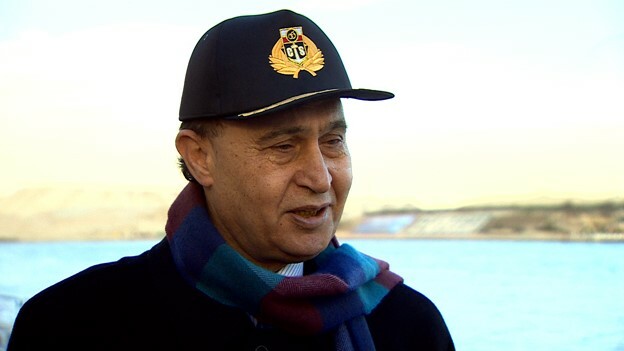 Adm Mameesh dismissed that attack as a one-off. "I was on board the first ship afterwards that same day, to send a message that the canal is very safe," he said. "Since 25 January 2011 [the outbreak of the revolution which unseated Hosni Mubarak] navigation in the Suez Canal didn't stop for a second. It means we secure our canal very well." The greatest risk may be for the Egyptian leader. President Sisi needs flagship projects like this to deliver revenue, jobs and investment. Otherwise the unrest, which lies below the waterline here, could resurface. Now, as in the past, Egypt's fate is linked to the canal. Map, timeline and summary of main flashpoints around Egypt.